DVS students will meet Monday mornings 8-8:50, and Friday mornings 8-9:30 in the DVS Forum. DVD/C students will meet Wednesday mornings 8-8:50 in the DVC Music Studio, and on Friday mornings 8-9:30 in the DVS, forum. tharwell@davincischools.org for any questions, or to sign up. Designers, below you will find the link for seminar sign-ups and the course descriptions by day they are offered. Seminar sign-ups open today, Monday 8/31 at 9:00 am, and will close on Friday 9/4 at 3:00 pm. Any submission after that time will be considered late and you run the risk of not getting a preferred choice. It is your responsibility to sign up and you have 5 days to do so. Ask your teachers or counselors for help if you are having any difficulties. Sign up early and take the time to read through the descriptions carefully! While schedule change requests can be made during the first week of seminars, they may not be granted due to limiting seating in most of the classes. Hello Designers. If you want an early sneak peak, check out the links below to see what seminar options you have for this fall semester! Sign-ups open tomorrow morning (8/31) at 9:00 am and close Friday 9/4 at 3:00 pm. Picture Day – This Friday, 9/4! Hello Designers, please mark your calendars for this Friday 9/4 as DVD Picture Day! Photos will be taken by the talented Stacee Lianna. See flyer below for more information and contact the school with any further questions. Hello, Designers. We hope you are enjoying your weekend and staying cool! This week is the Freshman Overnighter for 9th graders. We are so excited for all the fun that lies ahead with that trip. 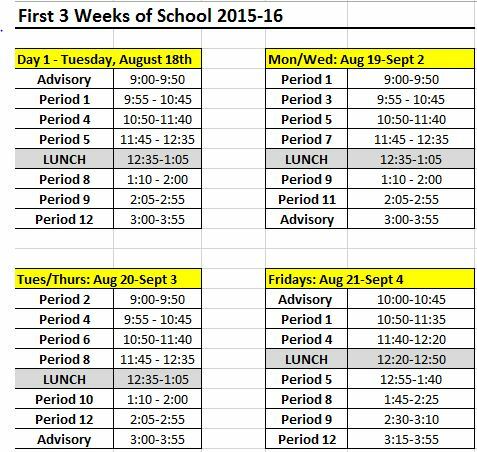 We leave on Wednesday morning and return on Thursday around 2:30-3:00 pm. 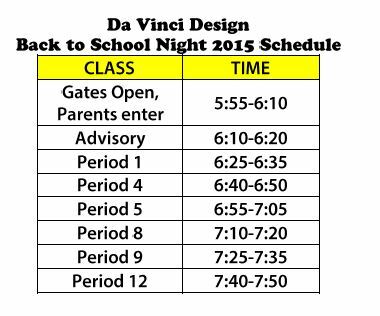 Students will attend advisory upon return, so families, please plan for normal pick up time. Seminar Sign-Ups will be available at 9am on Monday 8/31. Sign-ups will close on Friday 9/4 at 3 pm. Descriptions of all courses will be posted on the blog (we are hoping to get a finalized list posted tomorrow, Sunday 8/30, so you can have a sneak peak of the choices!). Any submissions or requests made after the deadline will be considered late and you run the risk of missing out on your preferred course! There will be a bit of time in advisory and/or your classes, but we do recommend that you sign-up from home if you can. Seminar courses will begin Tuesday, September 8th. We also want to commend our students on the amazing job they have been doing with dress code so far this year! The number of dress code violators has significantly decreased and our entire staff is extremely proud of our DVD students. Keep up the excellent work, everyone! Also, remember that if you run out of collared shirts, or forget to wear one, you can always stop by the principal’s office first thing in the morning to borrow one for the day without penalty. Have a wonderful weekend and we will see you Monday. Our counselors will also be available in the board room (front office area) should you want to meet and chat with them as well. We look forward to seeing you there! 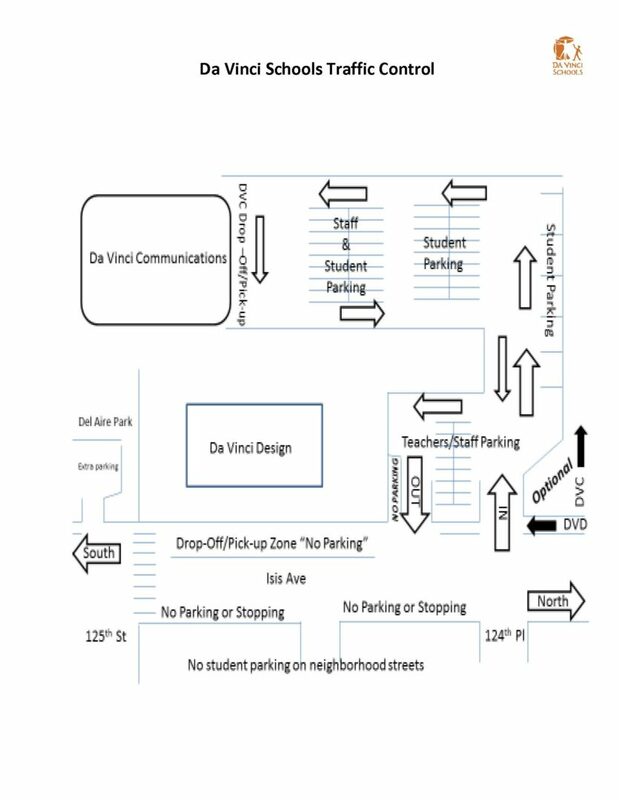 Allow ample time for parking and we ask that you please respect the surrounding residential area by obeying the traffic and parking regulations. Also, if you would like to nominate someone, or be nominated, for a seat on the Da Vinci Design School Site Council, we have a few open slots. The council will meet 4 times a year in the evenings to discuss, vote on, and provide feedback on various school topics. We are looking for parent and student nominees. If you are interested in being nominated for the council or would like to nominate another individual, please send a brief bio as well as the reasons you are interested to Kate Parsons, Principal, at kparsons@davincischools.org by Monday August 31st. Voting for the council will take place via an online survey posted to the blog later that week and new members will be announced once voting has closed. 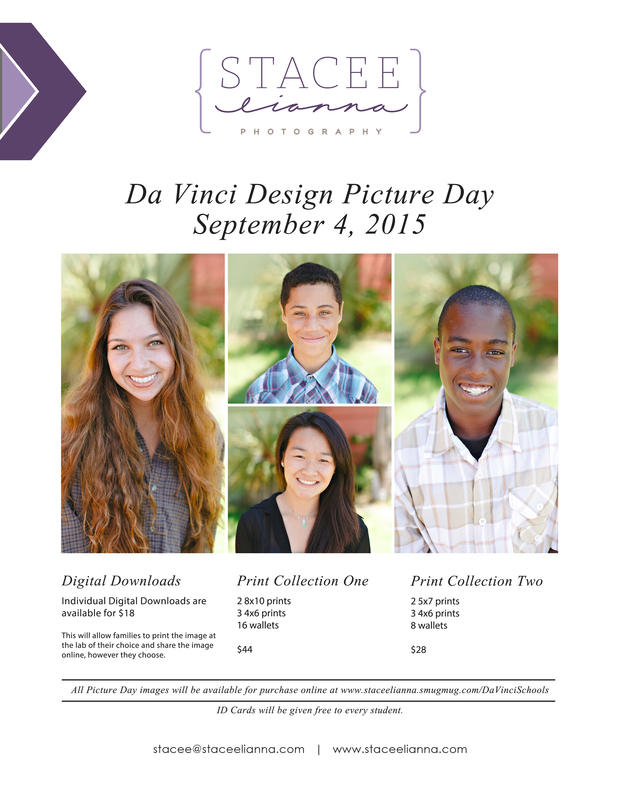 Da Vinci Design is excited to announce that this year’s student yearbook pictures will be taken by the talented Stacee Lianna. Please review our picture day information below and mark your calendars for Friday, 9/4. Hello Designers! We hope you had a wonderful first week back at school. Below is your Week 2 update and a few dates to put on the calendar. We look forward to seeing you all at 6 pm this Wednesday 8/26 for Back to School Night! You will begin the evening in your student’s ADVISORY class. Don’t forget – your teachers have office hours EVERY Wednesday and Thursday morning from 8:00-8:50 if you need help with anything or just need a quiet space to do work. We highly encourage and expect that all students are utilizing these office hours. Doors close each morning at 8:15 am to minimize distractions, so make sure to be on time! Enjoy the rest of your weekend and we will see you Monday! 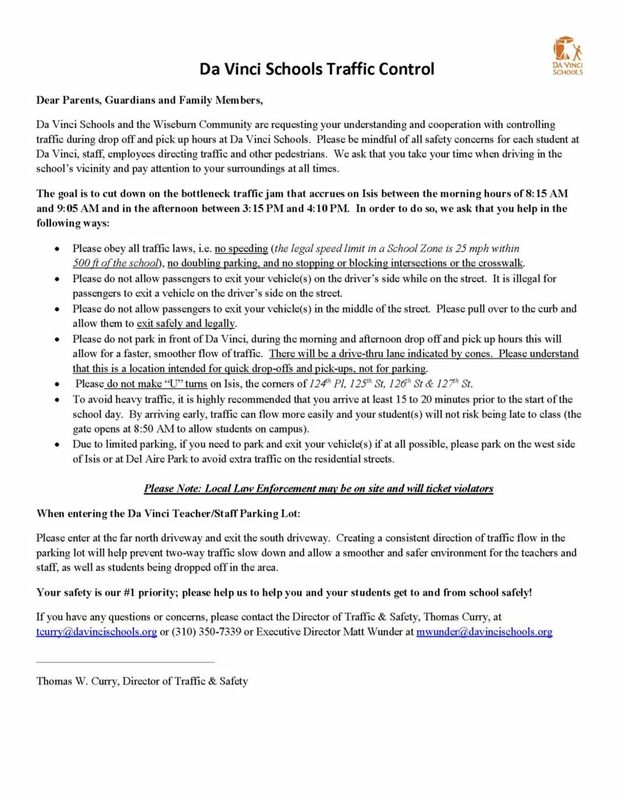 2015-16 Traffic Information – PLEASE READ! Thank you, and we will see you Tuesday! We hope you had an awesome summer! We are so excited for the 2015-2016 school year and are looking forward to our students returning on Tuesday, August 18th at 9:00am for the first day of school! When your students arrive on that morning, there will be boards in the front of the school telling them who their advisor will be, and after they all walk through the front gates, they will go to that advisor’s classroom for the morning, and then they will receive their class schedules. 1) As you shop for school clothes, please keep the school Dress Code in mind. Students should always be in a collared tops or Da Vinci shirts. 2) Students can bring their own lunch or purchase it for $4. You should have received a letter in the mail explaining the process of creating an account into which you can deposit money for your child’s lunch. 3) Seminars begin September 8th. Expect a posted link to descriptions and sign-ups about 2 weeks prior to that date. 4) We have an online process in order to capture vital information needed for our students’ files, as well as information need for Da Vinci to qualify for various grants and programs that benefit all students. The process is simple, just a few steps and will only take a few minutes. If you do not have a computer or Internet access, please come by any of our school’s offices to complete the process in person. If your student will be returning to Da Vinci this coming 2015-16 school year, you are required to complete the on-line enrollment process ASAP. If your student is NOT returning to Da Vinci this coming 2015-16 school year, we need you to complete the on-line withdrawal process ASAP. There is a long wait list of students who are hoping to get in to DVD, so if you have changed your mind and your child will not be attending, please let me know so that we can bring in another student on the wait list! Please use the above log-in information for this process. If you have any questions or concerns, please do not hesitate to call our office at 310-725-5800. Thank you!